Just as I turned my head this big Alligator broke the surface. At first I didn’t see the fish, I noticed the arched back and thought he would lean back, growl, and do the aggressive ‘profile’. It didn’t take him long to finish the fish, but I did get a nice series here. Note; an Alligator ‘profile’ is when they raise both their head and tail out of the water as high as they can. 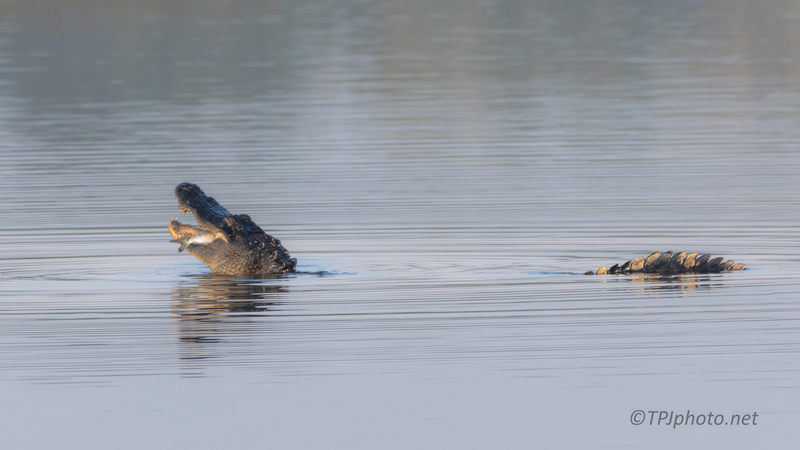 Usually a deep, and loud, rumble (growl) is made to alert any other Alligators (sometimes people) nearby. Profiling is to challenge for a territory or mate. A big Alligator can vibrate the water around them, almost waves. Thanks. And yep, it’s a rule to keep shooting even after you think the scene is done. I learned that from a sports photog. Many people let up on the shutter and miss the celebration of a goal, the high fives, etc. As it is I miss a ton for ending early LOL. The negative space of the water really makes these images work well. Great shots. Thank you. What caught me was how ‘clean’ the water was. This is a marsh, on the edge of a swamp. Always something floating here.